Maxim Care Pure Emu Gel Caps are an excellent source of essential fatty acids Omega 3 (linolenic acid) and Omega 6 (linoleic acid). Essential fatty acids must be obtained from the diet. They contribute to heart and vascular health and are vital to a healthy body. When ingested, Emu Oil can help support the health of the joints. Emu Oil is easily processed by the body. Plant based essential fatty acids have been found to have poor absorption rate in comparison to animal based essential fatty acids. 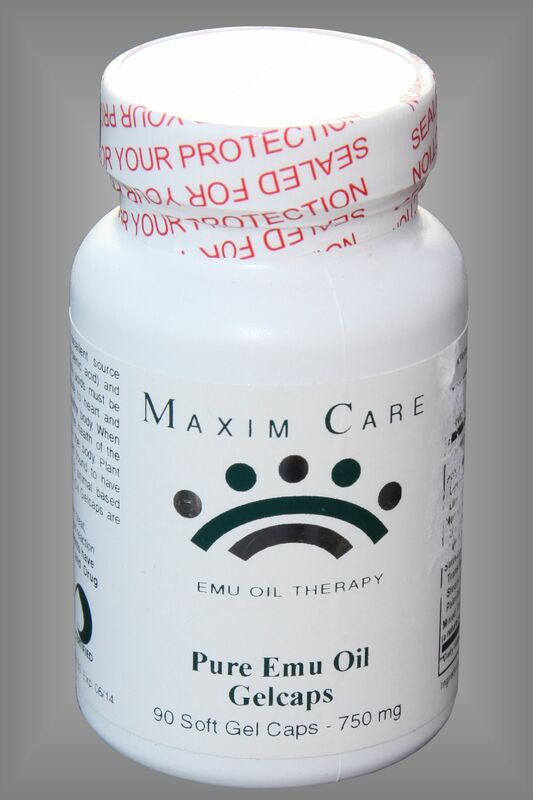 Maxim Care Pure Emu Oil Gel Caps are 100 % natural! These essential fatty acids are widely used in low cholesterol diets. Directions: As a dietary supplement, adults take three to six softgels daily with water. This product is not intended to diagnose, treat, cure, or to prevent any disease. If allergic reaction occurs, discontinue use. These statements have not been evaluated by the Food and Drug Administration. (A natural source of Vitamin E used to protect freshness). 90 Soft Gel Caps 1000 mg. Ingredients: Emu Oil, Gelatin, Mixed Tocopherols (Vitamin E ).